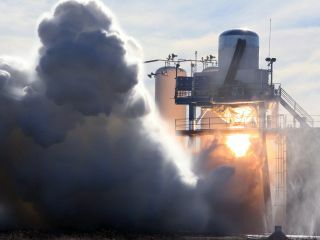 This still photo taken from a SpaceX video shows the full-duration orbit insertion test firing of the Falcon 9 rocket's second stage, conducted on January 2, 2010 in McGregor, Texas. A brand-newFalcon 9 rocket envisioned to launch commercial cargo ships to theInternational Space Station has passed its final engine test, clearing the wayfor its maiden flight in the next few months. Built bySpace Exploration Technologies (SpaceX) of Hawthorne, Calif., the Falcon 9rocket is a two-stage booster designed to launch the company?s Dragonspacecraft to orbit. It is the lynchpin rocket behind SpaceX?s plan to launchcargo ships to the space station under a $1.6 billion contract with NASA. SpaceXannounced this week that the Falcon 9 rocket?s second stage successfullycompleted a full-duration test firing at the company?s proving grounds inTexas. The test was the last hurdle for the upcoming demonstration launch,which is targeted to lift off from Cape Canaveral Air Force Station in Florida. ?This wasthe final stage firing required for launch, so the second stage will soon bepackaged for shipment and should arrive at Cape Canaveral by the end of themonth,? said SpaceX founder Elon Musk in a Jan. 4 update. ?Depending on howwell our full vehicle integration goes, launch should occur one to three monthslater.? SpaceX isone of two companies contracted by NASA to provide commercialcargo shipments to the International Space Station. Orbital Sciences,Corp., of Virginia, is building its own Cygnus vehicles and Taurus 2 rocketsunder a separate contract. Both companies had received seed money from NASAunder its Commercial Orbital Transportation System (COTS) program aimed atspurring development of privately developed spacecraft. The Falcon9 rocket stands 180 feet (55 meters) tall and is the launch vehicle developedby SpaceX. The first, the smaller Falcon 1, made its first successful launch in2008 and delivered its first commercial payload ? a Malaysian communicationsatellite ? into orbit last year. 2009 alsosaw several other milestones for SpaceX, including the delivery of the Dragonrendezvous laser sensor ? called DragonEye ? to the space station, the firsttraining session with NASA astronauts to practice docking operations and successfultests of the protective material to be used on Dragon heat shields duringre-entry. In hisupdate, Musk thanked NASA, the U.S. Air Force, the Federal AviationAdministration and SpaceX customers for their support and looked ahead to theFalcon 9 test flights planned for later this year. ?And ofcourse, I?d like to thank the whole SpaceX team for their unwavering commitmentto our company and our mission, especially over these last few months,? Musksaid. ?Through their hard work and dedication, 2010 promises to be anothergreat year. ?